Transportation uses one third of the energy of the western world, and reducing its footprint is one of the major areas of interest in urban design. 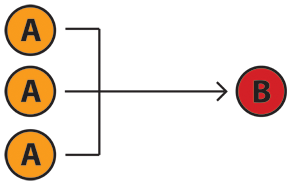 Energy reduction is one of the largest potential gains in energy, and one of the most cost effective ways to engage rising energy costs, pollution problems and congestion. In this context this results in a focus on the reduction of energy usage through a diminution of motorized transport and an encouragement of non motorized ways of moving about. This article is about analyzing the problem of inner city traffic reduction, a set of frameworks to organize development in this area and the exploration of tools to achieve this, resulting from a study of various cities including Stockholm, Delft, Copenhagen and Antwerp. How do we address the problem of inner city transportation in a coherent and communicable manner? How do we split up tasks to different agencies and how do we define a frame work within which we can work to tackle these tightly intertwined and complex issues? One method of looking at it is to investigate the core need of transportation, and just focus on that. For this purpose transportation is a problem that can be captured in a single sentence or diagram: an individual's need or desire to go from one geographical point to the other. To organize our thinking regarding inner city transportation we need to find a framework to do so. I offer two ways of thinking about this, one by categorical type (method 1) and one by diagram (method 2). Both offer ways to develop plans for traffic reduction and give insight into the various components of travel. The analysis of a tranportation system or an urban plan regarding these matters is not complete just looking at these two methods. The choices involved in moving about are different for each individual, and psychological factors come into play, as well as more qualitative issues concerning status, comfort and safety. These should be investigated separately. The methods offered here deal with the reduction fo traffic in a permanent, sustainable manner, on large scales within the city. The categorical approach offers a simple categorization of travel types organized by their necessity (required/desired) and their dependence (destination/mode). Using these categories allows one to discuss and communicate clearly about different types of travel and apply different methods for each. 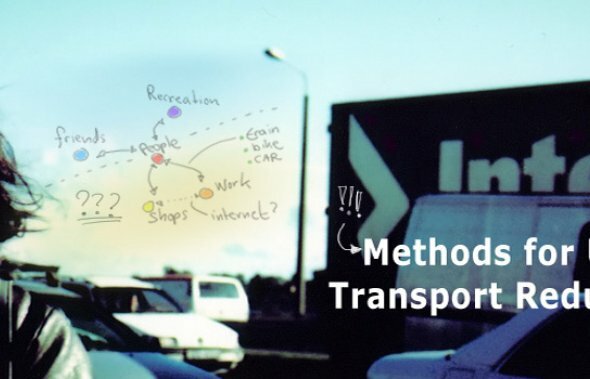 This method mostly applies to people transportation, but a similar categorization could be made for cargo. The categories are made up from a combination of two parameters, one paramter for the necessity of the travel (Required (R) or Desired (D)) and one parameter for the purpose of transport (Mode (M) or Destination (D)). Most travel can be captured in the resulting four categories. RM, required transportation by mode. These journeys consist of travel for which no viable alternative exists. Required means there is no choice involved in the journey, as opposed to travel by desire. Examples are emergency services, goods deliveries, land surveyors etc. Perhaps in time things like the postal service could be entirely replaced by electronic media, but it is unlikely that the transportation of goods and emergency services will be replaced by non-motorized individual transport soon. Thus, this is a category which is usually unwise to restrict. This poses certain interesting challenges for the pedestrianized city areas since they will always, at any time, require access by these RM types of travel, since it is the mode, not the destination or origin, that defines its nature. Attention to these types of travel are highly important for urban planning contexts where pedestrianization is a large component. One can accommodate for some RM travel by, for instance, providing dedicated ambulance and fire engine routes. RD, required transportation by destination. These are journeys that are required but for which the mode is not predefined. Travel such as work and school commute, gathering required goods for living, and administrative tasks fall into this category. The majority of travel takes place in this category, and it should be the focus of intervention. The profiles of the different types of RD travel change per country, as for instance New Zealand’s education travel is almost non existent but makes up a significant amount of the total travel in Great Britain (fig 1 & 2). RD type travel can be reduced significantly in the first order by applying an alternative destination or point of origin. This could mean work at home for commuting, moving closer to work, using a local school, setting up online administration centers instead of physical offices, and so on. Secondarily, this type of travel can almost always be converted in mode. One can take public transportation in many cases for this type of travel instead of the car. Where the first, alternative destination, can be hard to execute, it is something we as a society can work towards, and in the meantime we can execute efforts to implement the second intervention. The diagrammatic method offers more possibilities to deal with this category. This is a 'desire' travel, one which is not necessary for normal life, and is therefore mostly irregular in nature. Think vacations, visiting friends, any voluntary travel to reach a certain destination. It is not so that this type of travel should be discouraged. Visiting friends, going to the park or other leisurely travel is vital to a vibrant city life and should be accommodated for as much as possible. Nonetheless, some type of DD travel could be discouraged in favor of others. Flying to remote corners of the world each year for recreational purposes is problematic from an energy stand point, for instance, and could easily be replaced by more modest travel needs. Also, one could provide for more decentralized services such as more, smaller education and sports facilities instead of just a few large ones to reduce travel times an thus allow for more flexible mode switching. Of course for DD the switching of mode is also the easiest to accomplish and those kinds of interventions can be readily implemented. DM is a voluntary type of travel chosen for its mode, not for its destination. Think road trip. This is a type that is hard to reduce. It's also just a small part of the transport volume. This type of travel is a small contender in this framework but one which has roots that affect RD and DD as well. The main problem with DM when the mode is a car is that it is the car itself which provides the reason for travel, often there not being a destination. It is something present and thoroughly embedded in many western cultures, from cruising down the strip to transcontinental car explorations. It is very difficult to provide a replacement for these kind of travel, since the personal space a car offers, the feeling of freedom and the cultural associations that have sprung up around the car, mainly in the United States, are hard to overcome. Still, one should consider that less that one century ago culture and humanity was very able to do without the car, and it should not be hard to envision that the future does not necessarily include personalized motorized transport either. An essential issue with this type is that, even if it's only performed infrequently, it provides a reason to perform other transport types with the same mode. After all, if you have bought a car because you like driving it in the weekends, there's a high chance you're going to use it to bring the kids to school and drive to work as well. And vice versa. Ways of reducing DM type of travel is by providing quality alternatives, such as sufficient parks so one can be alone in a beautiful environment, and discouraging the use of the car as a form of entertainment, such as for instance with economical incentives (congestion charging), protecting natural areas by only allowing residents with passes, such as happens in the Netherlands, and so on. Another way of looking at city travel is by way of examining the three elements in the diagram below, where A is the origin of travel, the arrow being the mode and route, and B the destination. This simple diagrammatic approach leads to a very clear framework that can be directly applied to policy, design and communication challenges. It helps to frame thinking about transportation in a very elementary manner and thus come up with solutions that address the root of the issue, rather than more entangled issues. For each and every journey imaginable we could apply this framework and see if there is an alternative. This also helps to determine solutions for RD, DD and DM type travel. The way we can subsequently deal with this diagram is by investigating the possibilities for each element. Let’s start with the arrow, the journey itself. We could just remove the arrow, and be rid of the whole problem. How can we achieve this? The removal of travel can imply that the travel by itself was not necessary, therefore this can usually only be applied to desire travel. But that is just a small part of all travel. What else can this be used for? One could, without removing the workplace (B) or the home (A) remove travel by introducing a one-day-work-at-home scheme. Small things matter as well. If you run an analysis of all travel performed in the day by all people, eventhough they were required travel officially, you might find that many of these journeys are unnecessary. Going to the store twice because you have forgotten something. Going around the city one more time because you got lost. For many of these unnecessary travels that are not particularly desirable we can find a possible solution. GPS navigation systems, A shopping list. Whatever it is, it will only happen once it becomes ingrained in the culture of our society that travel is a precious event. It is expensive in terms of energy, one of the most energy expensive things we do. When the energy prices continue to rise, the effects of this will become self evident. Now let’s look at B. We can get rid of the arrow as well by bringing the destination to the origin. What sort of solutions does this imply? Think about the commute. One travels to the same place each day to perform a certain set of actions for most of that day, and then return to where you came from. In reality this is not a very natural flow, depending on the type of work. One can instead work at home just as well for many types of jobs, and this becomes increasingly more feasible with networking technologies developing. On an urban design level we can encourage this by requiring residential buildings to make work space available in houses. Pushing this to another level, one can provide flexible space in each house to be used as a shop, office, or living space, depending on who lives there. The space is easily converted and adapted for different uses. Not only does this provide the potential for less travel, it makes for high quality living spaces, a more vibrant street life with shops and small businesses, and creates a mixed demographic that is harder to achieve in less diverse neighborhoods. One more imaginative solution for this regarding shopping is the Dutch SRV car. It’s a convenience store on (electric) wheels, which has its origins in the milk man delivery donkey carts. In the 50’s and 60’s these were quite popular, created by a network of merchant companies. Some of these electric vehicles still operate today and provide a big resource for elderly people and for those living in small rural villages that do not have a store of their own. 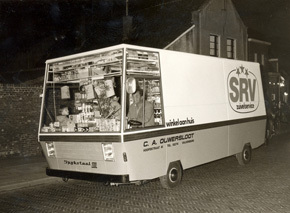 SRV electrical driving convenience store in the Netherlands. They were typically built by Spijkstaal but models from Hoogstra, Rengocar and others exist. Somewhat analogous to the description above, we can move the origin to the destination. Examples of these would be boarding schools in remote areas rather than long student commutes, moving closer to work, and encouraging this. In China for instance it is common for large companies to provide residences for their employees close by. Other examples include living in dense metropolitan areas where most needs are only a short stroll away, and the people density allows for friends to be much closer to one another. Other than the three options mentioned above, we could envision the journey itself taking a different form, rather than disappearing. We could for instance see how the journey becomes an electronic instead of a physical one, such as creating more administrative services on the internet rather than in person, such as motor vehicle registration, taxes, and other governmental necessities. Also, the way the categorical system looks at things can be formed in a diagram where the choice between modes for the journey is captured, and preferential modes be selected. 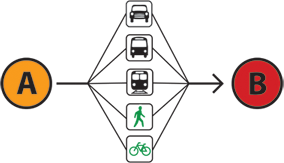 Lastly we could see modifications on the diagram such as the figure below which expresses multiple origins or destinations to be merged to allow for more efficient public transportation, or carpooling. All in all, the diagrammatical way of analyzing transportation, and subsequently using to discover avenues for reducing traffic need and pressure is a great way to complement Method 1. It can be used in workshops and to structure rigorous searches for new solutions to traffic issues. These methods can guide designers and policy developers in organizing thoughts and discussions about transport issues. They are not meant as a substitute for research into context specific problems, rather, they expand the capacity to find fundamental solutions. A related article to this is the Pedestrianization Tools Survey. It can be used to augment solutions found using these methods and investigates on a material level what can be achieved with very simple and affordable interventions in the public realm to reduce reliance on the automobile.